Apologies in advance as this will be a photo-heavy post. Since moving into our current house about five years ago, I have been working on a small workbench built out of 2x4s and OSB. The work surface measured 4 feet by 30 inches. It also had four casters fixed to the feet. This had started out as a general workbench, not something woodworking focused. 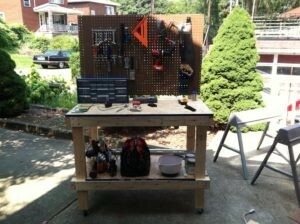 Eventually, I lopped off the pegboard back and added a face vise. 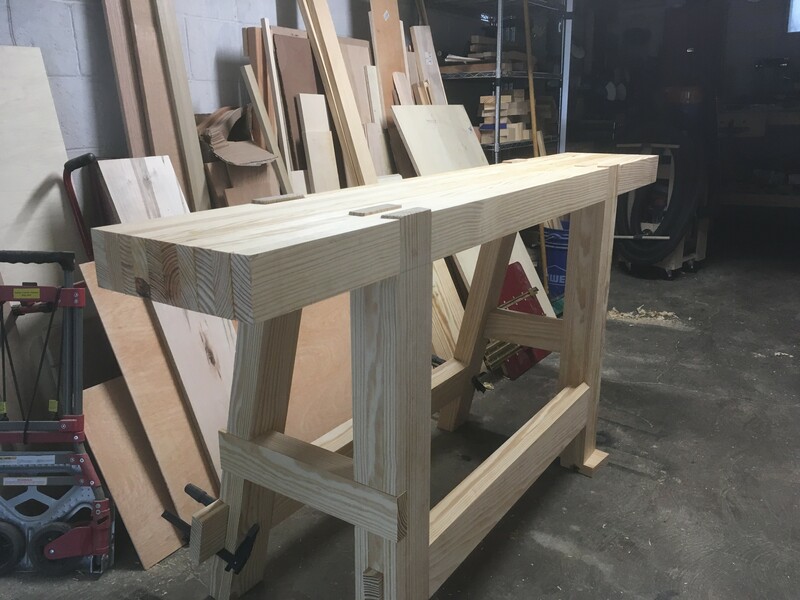 This bench then served as my primary bench for all woodworking, which is to say, it mainly held my lathe, which could be pushed out of the way when I needed the front half of the bench. 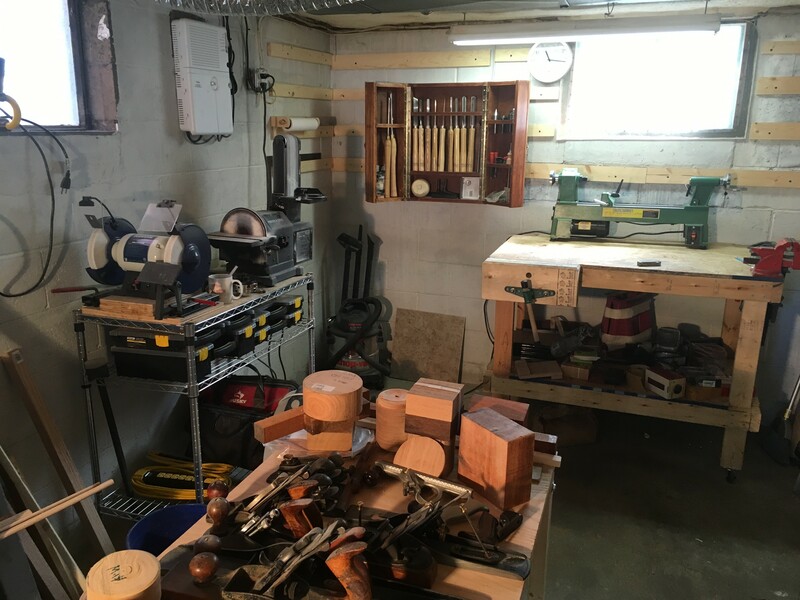 In addition to turning, I managed to complete a few other projects, including a shaker candle stand, cabinets, and picture frames. 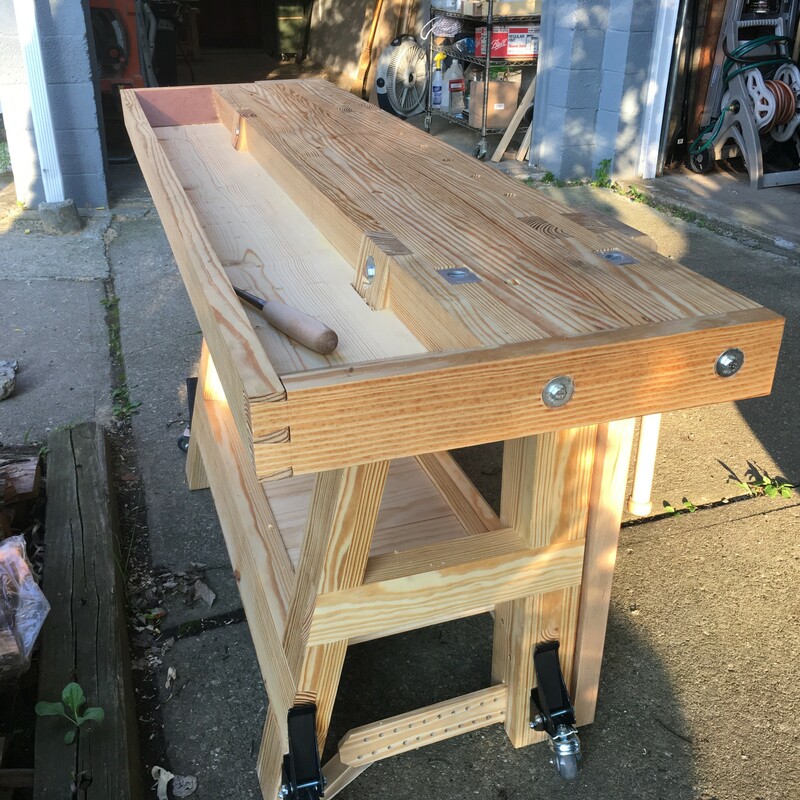 However, with a thin OSB top, lack of squareness, lack of work holding for face work, and poor front vise setup, the bench has been poorly suited building new hand tool skills. 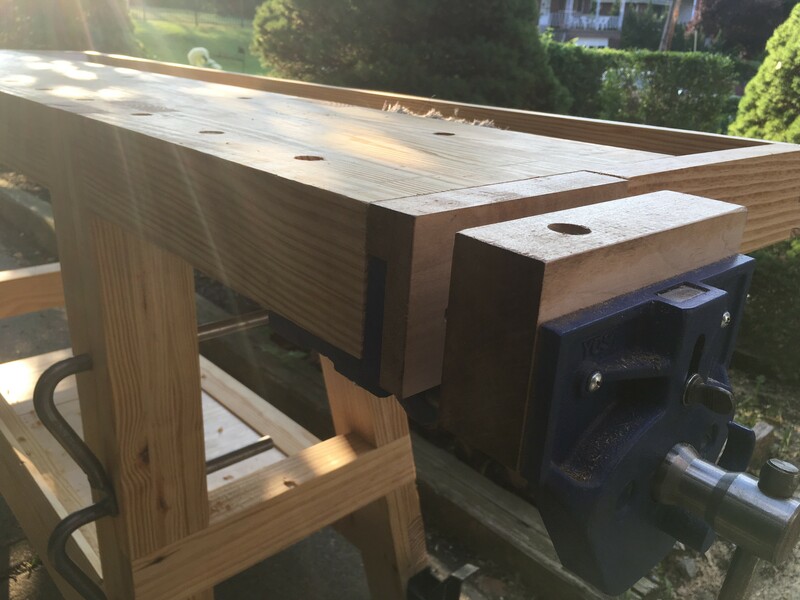 Additionally, at four feet long, I was unable to support my lathe with a bed extension. That meant I haven’t been able to turn more than 18 inches between centers, precluding turning chair spindles. Other written sources included online plans for benches, blog posts, and articles in both Popular Woodworking and Fine Woodworking. 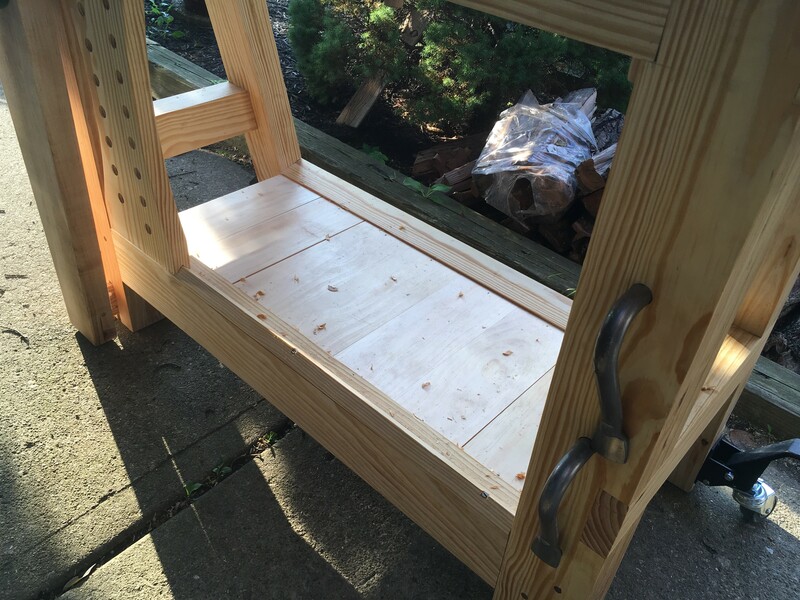 and a pain of episodes recreating a French workbench with a narrow top, splayed rear legs, and tool well. I’ve seen both Part I and Part II of this build a couple of times on PBS and was a fan of the general design. I wanted a bench that is between five and six feet long. I want a bench no deeper than about 22 inches. The new bench needs to be heavy. It needs to be solid. With that in mind, I started to design a bench in the Roubo-style, made out of laminated SYP. Firing up Sketchup, I started making laminations and put together an initial idea. It consisted of 15 laminations of ripped down 2×12 stock for a final width of about 22 inches. 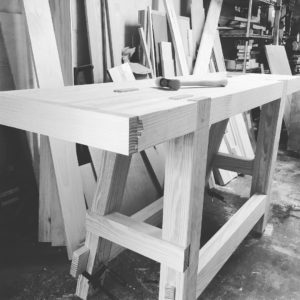 Four legs would be laminated and mortised into the top, each with a double tenon. 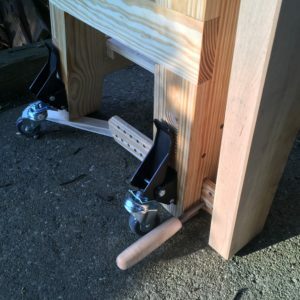 A leg vise would be added to the front left leg and I would install my Yost quick release vise on the right side as a tail vise. That is about as far as I made it with this design. I never got around to adding in stretchers, shelves, or figuring out a dog or holdfast arrangement. As I noted above, I was a fan of the French Bench design demonstrated by Roy Underhill. As much as I liked that design, he used a sliding dovetail for both the front legs and rear, splayed, legs, that seemed (and still does seem) a bit too intimidating for my current skill set. I figured that I wouldn’t be able to use splay-leg design as a result. However, I came across a great piece written by Jim McConnell on his blog The Daily Skep. 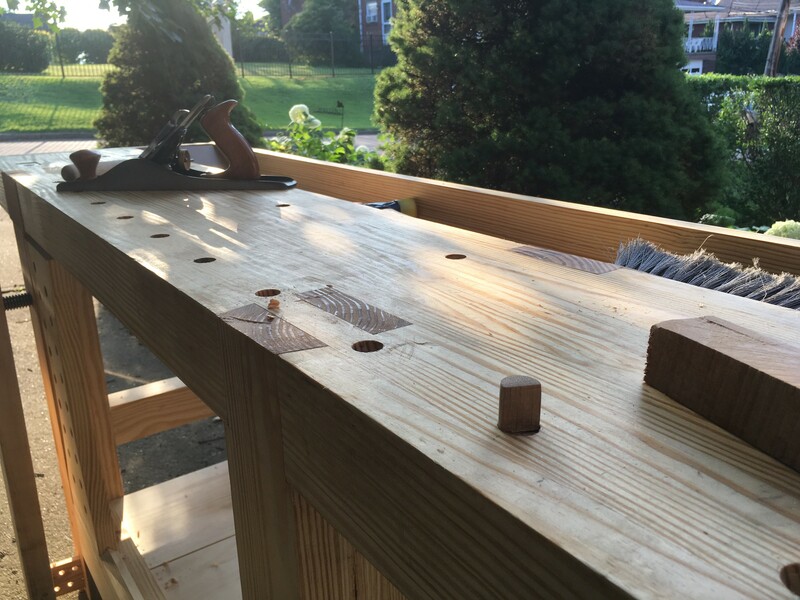 In The Student Bench Takes Shape, he detailed building a couple small benches for use by students learning hand tool work. His design for the benches featured a narrow top, front legs mortised into the bench, and splayed rear legs. 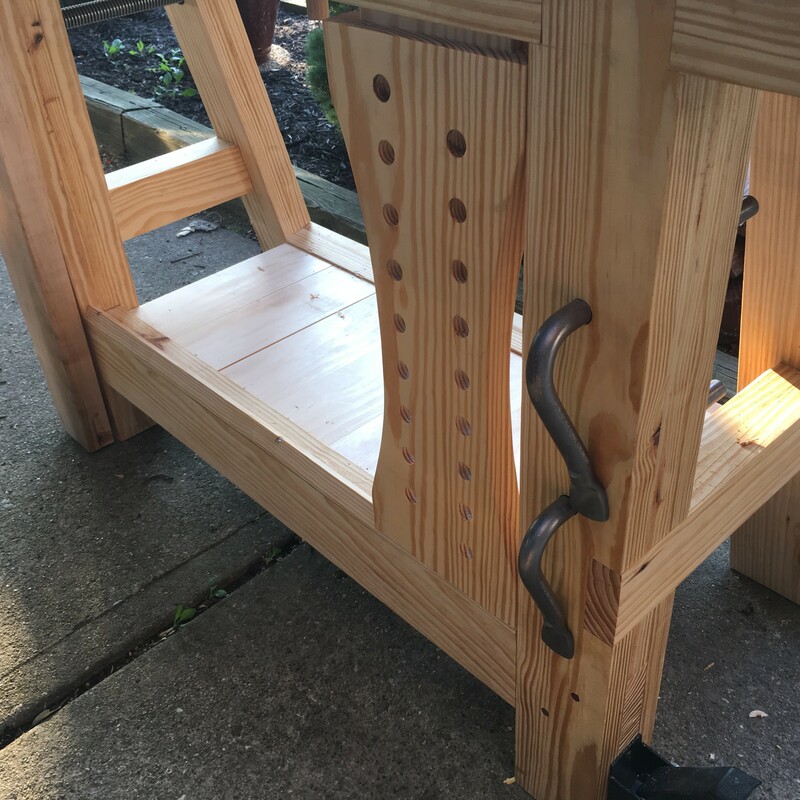 Instead of using a sliding dovetail to attach the rear legs, he cut a birdsbeak and drove screws through the leg and into the top. The birdsbeak, with a matching notch cut into the benchtop, was the solution to my hang-up with Roy’s French Bench design. I went back to SketchUp and put together a new design. The front legs are still joined with a double tenon. However, the back legs are now splayed and given a birdsbeak with notches cut into the benchtop. Additionally, I brought the width down to about 12 1/2″, with a tool well that is approximately six inches wide. The total designed width comes in at just under 22 inches. The top is about 3 1/2″ thick. I also added a sliding deadman and a shelf. A leg vise remains at the front left and the quick release vise continues to act as a tail vise. With the design locked in, I figured out a cut list and it was off to buy some lumber. 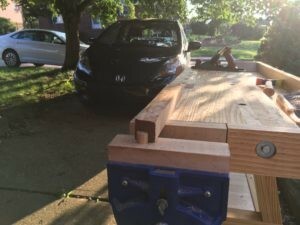 Since the back half of the bench would be a tool well, and the front half would be narrow, I significantly cut down on my lumber needs. I purchased four 2×10 and four 2×12 eight-foot lengths of SVP in early April. When I got them home they went into the garage and were stickered with the intention of starting on the bench after waiting another two weeks. Due to recurrent back problems, I had to wait nearly two months before returning to the workshop. 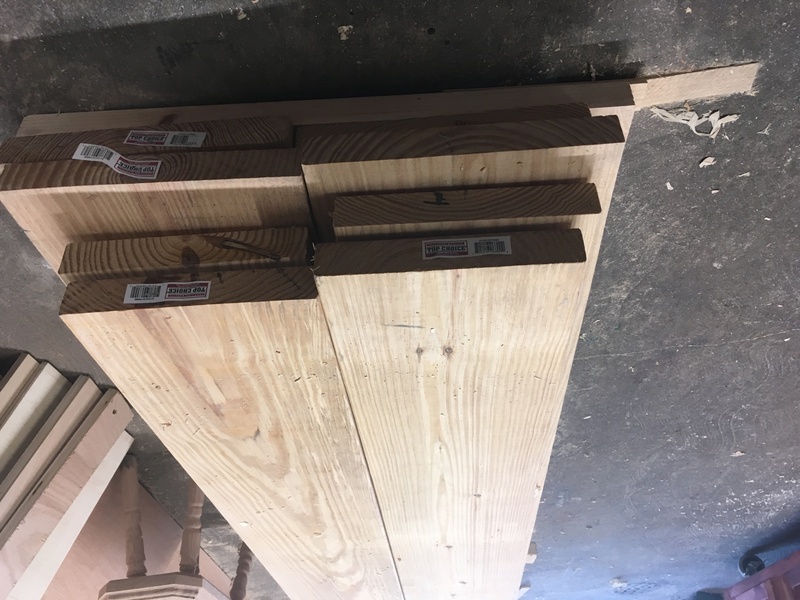 When I did go back to the shop, I found that the lumber had generally behaved well. However, it all needed to be jointed and thicknessed due to twist and bowing in most pieces. 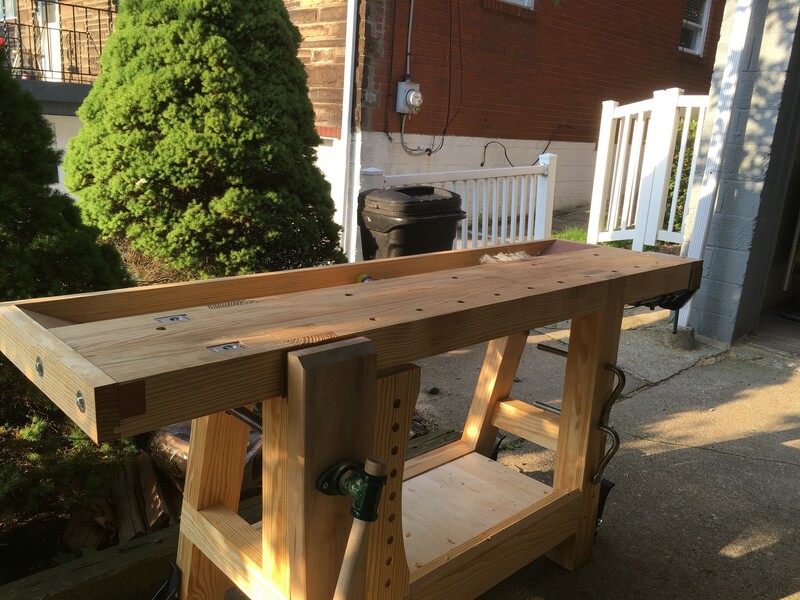 Since I don’t have a jointer, I put together a six-foot jointer sled for my thickness planer. 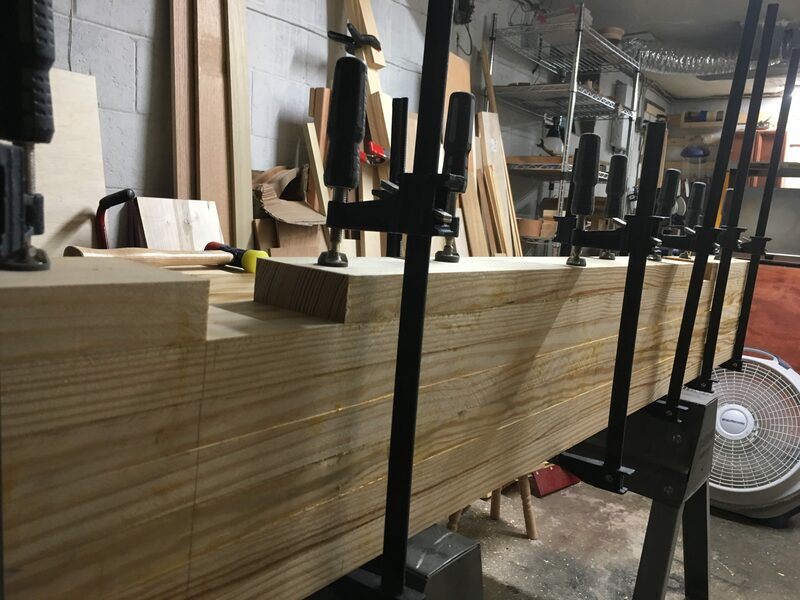 The time involved in setting up each piece of lumber, including gluing shims, cutting them down, and praying the glue holds to the melamine have convinced me that I should keep my eye out for a nice used jointer. With everything jointed and thicknessed to 1 1/4″ inches I was able to start the lamination process. I had thought about using biscuits to help with alignment but decided against it. In retrospect, it would have made things much easier. 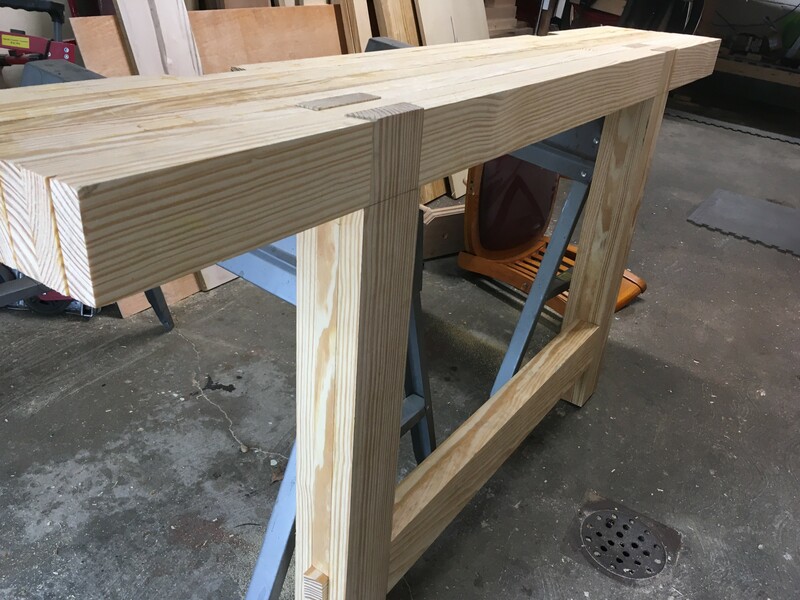 Working on a set of steel sawhorses that I’ve had since moving into the house, I laminated the center section of the benchtop, about six laminations, in one go. Despite my best efforts (or, mediocre efforts if we’re being honest), I ended up with some vertical misalignment between each lamination. While I was able to correct it later, it meant sacrificing a little bit of thickness in the top). I’m going to put part of this down to having waited a few days between ripping and thicknessing material and moving on to glueup. Even with nearly two months in my garage, the SYP is still wet and had movement in it. Lesson learned: mill your stock and glue it up the same day. After getting the center section glued up, I went on to the front three laminations. 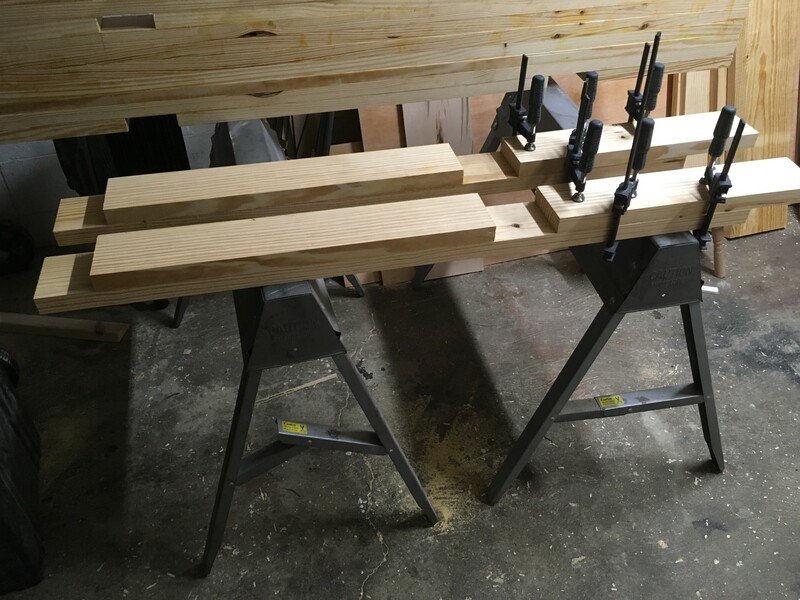 Each of these was precut to fit the leg tenons, including precutting the dovetails mortise for the front tenon. The notches for the rear legs were also precut and glued up in a similar manner. With the benchtop glued up, I went ahead and cut and glued up both the front and rear legs. The front legs consisted of a three-board thick lamination, with a precut mortise for the front stretcher. The rear legs are two boards thick. 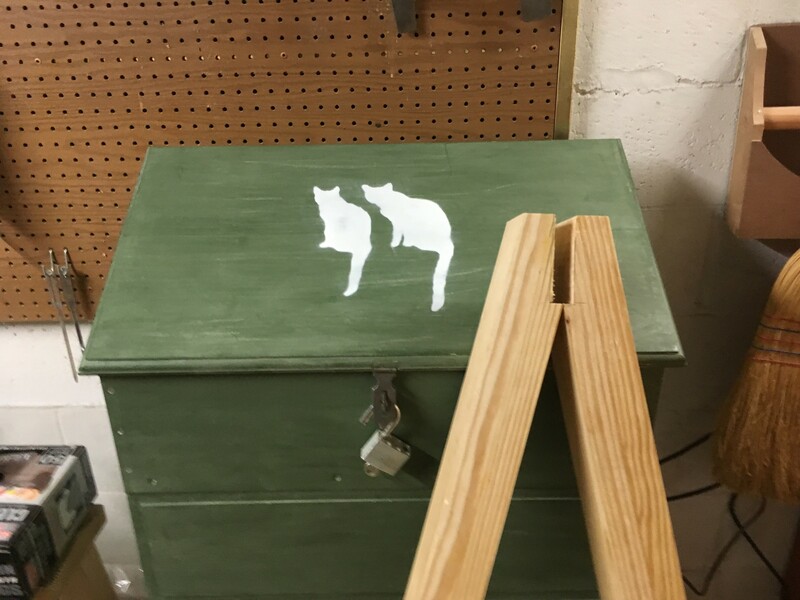 Additionally, the front legs have the tenons pre-made by gluing them up about 3.5″ above the middle section. Pre-cutting the joinery before glueup required a bit of patience. However, it turned out well, with a tight and solid fit for the front legs. The rear legs were glued up solid and then had birdsbeaks cut into each leg resulting in 12.5 degrees of splay. From here it was a matter of gluing up and fitting stretchers to complete the base. The side stretchers were cut using a dado stack on the table saw as well as a miter gauge for the angles in the rear legs. With these angles precisely cut, maintaining the rear splay easy. The top was then run through the thickness planer using the same jointing method as described earlier. With the alignment issues in the top cleaned up, the initial dry fit went perfectly. Lag bolts were also used to secure the birdsbeaks to the benchtop. The front stretcher was drawbored. Glue for holding the other stretchers to the legs. The ends of the bench were then squared using a router and clamped straight edge. To do this, I used a 2 1/2″ inch long 1/2″ straight bit and a 1 1/2″ long 1/2″ flush-trim bit. 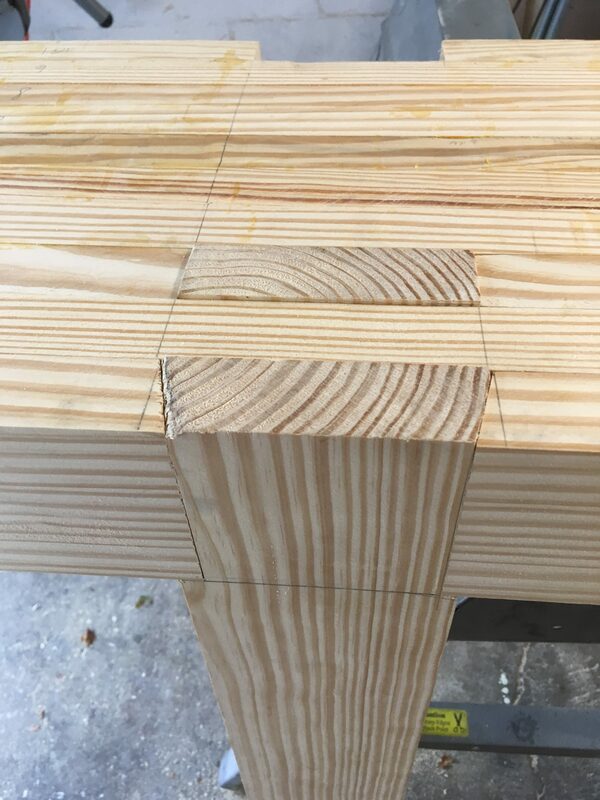 Since the benchtop is thicker than my longest router bit, the router was passed along the top using the straight edge and straight bit to establish a new square edge. Then the bench was flipped over and the flush-trim bit was used to finish squaring the end. This worked fairly well, except I experienced a bit of blowout on the front leg corner of the bench. This would later have a patch applied. 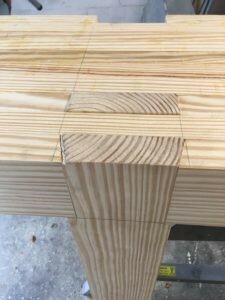 The easier way to do this would be to take the time to develop my handsaw skills to be able to get a square cut (both front to back and top to bottom). With the ends squared, the next step was to make and fit the tool well. First, I had to cut a 3/8″ x 3/8″ tongue, 3/8″ up from the bottom, on the ends of the bench. To do this, I used a 3/8 rabbet bit from the underside of the bench. Since the top remained over 3 1/4″ thick, the rabbet from the top would still have to come down early 2 1/2″. Rather than risk a blowout, or worse with the powered router, I decided to use my Veritas skew rabbet plane to cut the joint by hand. I was quickly I was able to cut the joint. I kind of wish I had also cut the bottom of the joint by hand. 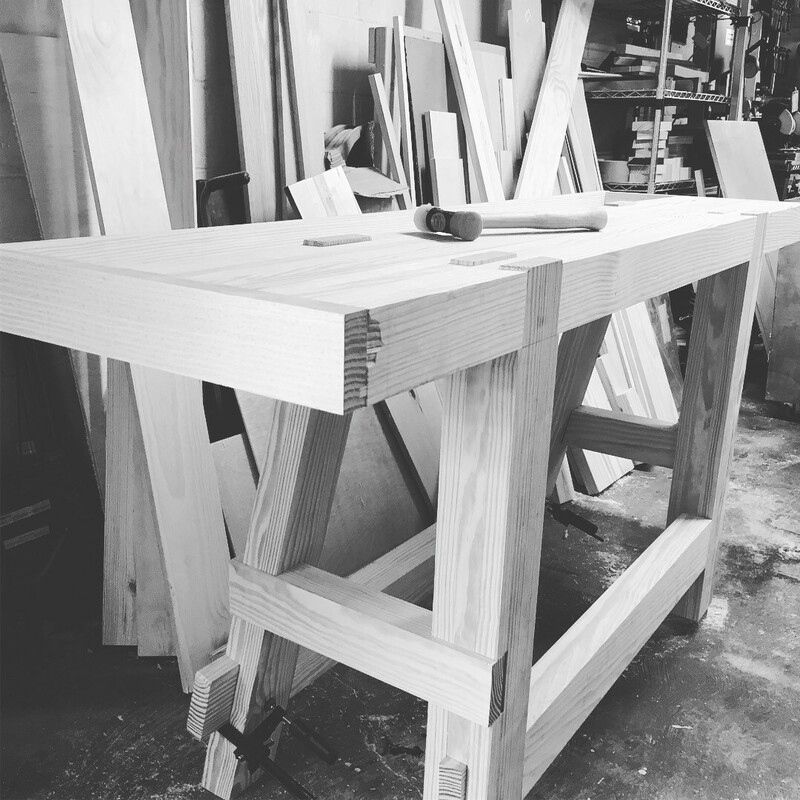 The tool well frame is dovetailed with grooves that extend all around. A groove was also added to the back of the bench. The grooves on the sides serve double duty. They mate with the tongues on the sides of the bench and hold the bottom of the tool well. I also used lag bolts to secure the tool well to the side of the bench. Cutting the dovetails was fairly straight forward, though, cutting pins in a six-foot long board was a bit of a challenge. I would recommend watching The French Bench-Part II linked above to see the how the pin boards cover the grooves. Ramps were added at the front and back of the tool well using off-cuts of pine and hardboard. These should help manage dust and shavings. At this point, I only had a few tasks left. I did a poor job of documenting as I built, so all of these photos are from the finished workbench. First, I needed to make my sliding deadman. 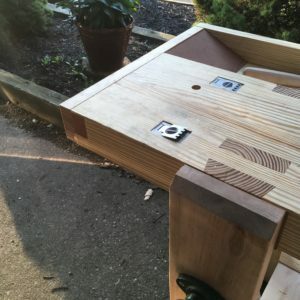 Using the plans from C. Schwarz’ book, I was able to quickly lay out and cut a sliding deadman to fit my bench. I hadn’t pre-cut the track into the front stretcher so I ripped down a 45-degree track from an extra piece of lumber. I then cut notches in three spots along the track to allow a screw to secure the track to the stretcher. Second, I needed to add face vise. 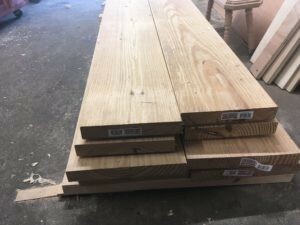 A trip to the lumber yard secured some 8/4 soft maple. This was then jointed and thicknessed to about 1 3/4″. 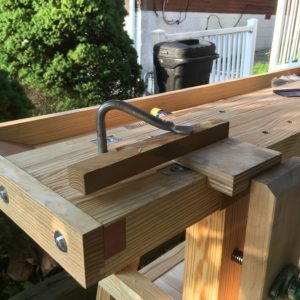 I purchased a vise screw from Lee Valley tools. 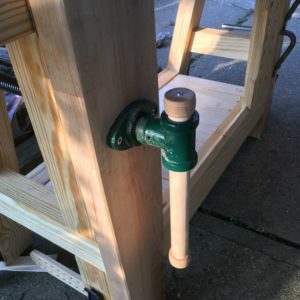 The flange was fully mortised into the front left leg and 1 1/8″ holes were bored in both the front leg and through the rear leg for the screw. Additionally, I cut a slot in the bottom of the front leg for the parallel guide. A hole was then bored in the maple vise chop. In addition, I had to cut a small mortise into the bottom of the chop for the parallel guide. Third, I added a tail vise. Back around Christmas, Amazon ran a sale on Yost vises. I knew that I wanted a quick release vise for my workbench at the time, so I picked up a 7-inch vise on sale (I haven’t seen the prices drop that low since). To attach this vise, I measured the width of the vise jaw. A section of the tongue was then removed to allow the vise to mount flush to the end of the bench. Fitting the vise had some issues the inside jaw is thicker at the bottom than the top. I used a rasp to sneak up on this angle to get a nice fit. I then cut piece of soft map to use as the inside jaw face. This was thicknessed down to match the tool well side. Since the vise is smaller than the benchtop, a notch was cut out of the inside to get flush with the top. A full thickness piece of soft maple was used for the outside jaw face. Fourth, I mortised two Lee Valley spring-loaded planing stops into the top of the bench. I bought these a few years ago and never had a bench that could accept them. They aren’t flush with the top as I know I’ll need to flatten the top at some point and don’t want to have to deal with removing them. While they have been fine in use so far, the underside of the casting was designed by someone who clearly didn’t consider the fact that they would have to be installed. There were three to four separate depths, not counting drilling for the cup that holds the spring. I can’t imagine that the materials cost to cast a flat (excepting the spring cup) bottom would break the profit margin on these. Either way, they are in. I’ve had a shelf below my old workbench since I build it. This has held, at various times, tools, a granite surface plate, tool manuals, sandpaper, and my lathe. 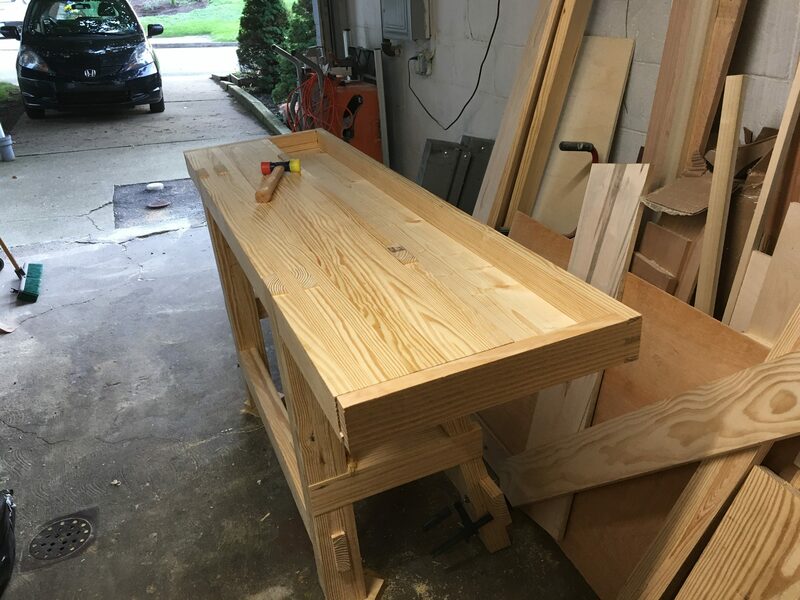 In addition to the obvious storage that it provides, the added mass of items on the shelf always helped keep the bench stable when planing. To add a shelf to the new bench, I first ripped down two shelf supports, including a 12.5-degree bevel on one to match the rear leg splay. The shelf is made up of 7 pieces. Each board has a bevel on one end. The edges are mated with tongue and groove joinery, cut with my Stanley No. 48. 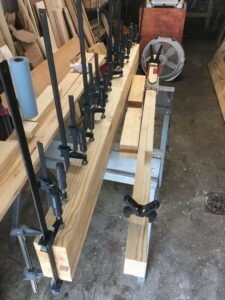 The shelf supports are screwed into the stretchers and the boards are nailed to the supports. This shelf is considerably smaller than my old bench. Since the bench itself is heavier, I’m not worried about losing mass. However, I’ll need to be more organized with what was living under the old bench. I added a row of dog holes 2 inches from the front edge of the bench along with a matching hole in the rear jaw of the quick release vise. The front planing stop is also in line with these holes. Additionally, I added four holes for holdfasts about three inches from the rear edge. Finally, one hole was added near the front planing stops. From start to finish, this build tool nearly a month of weekends and evenings. 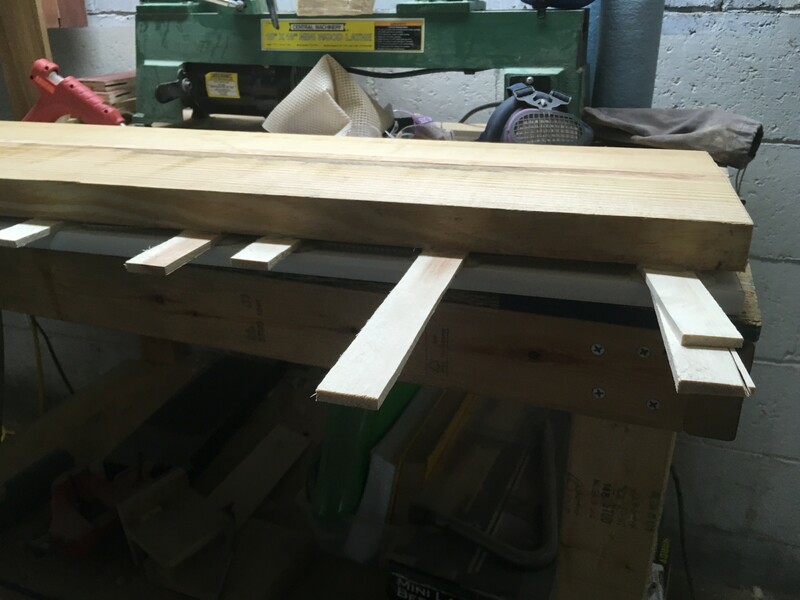 I’m left with a bench that is about 74 inches long, 21 inches deep, and 34 inches high. Due to the weight and my shop size, I added workbench casters to aid in moving the bench around. 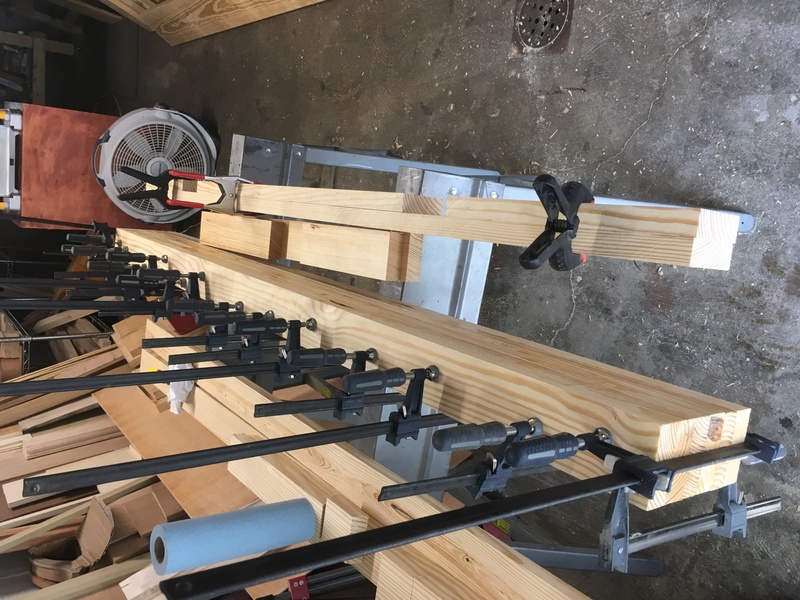 The bench has already been used for some chores around the shop, including building a new lumber rack. I definitely can’t wait to put it to use for some new furniture. I’ve included my SketchUp file for anyone that is interested. While I worked from this, there are some changes not reflected in the final build. The placement of holes is not accurate to the final build. Additionally, I changed my plans regarding the jaws on the tail vise, making them flush in the final build.